“I wish I could have spent more time with the kids when they were growing up. There was always a meet. Heather, my daughter, played tennis and won two state championships and I never saw her do it. Sean, my son, was racing motorcycles and doing well and I didn’t see him doing it enough. -Arkansas coach John McDonnell on the life of a collegiate coach. Saturday: Longhorns Sweep The men's Texas Longhors won the 4*Mile and 4*800 (without Leo Manzano) to sweep the 3 distance relays at Penn. (On the women's side Tennessee was the bridesmaid in all 3 distance relays). *AP Article On Friday at Penn: Texas Leonel Manzano Wins 3rd Straight Men's DMR (1st of 3?) as Michigan Women Add 4 x 1500 after Winning DMR Of Thursday Russell Brown is a damn good miler and he gave Manzano all he could handle but it seems like Manzano is basically unbeatable in the college ranks now that Lopez Lomong is gone. You know Texas has high expectations when Coach Vig apologizes for the slow time. "The time wasn't particularly fast, but we weren't trying to run fast today" With Manzano running, it's hard for Texas to lose. All they have to do is be anywhere close. *More On The Thursday's Women's DMR: N. Edwards Turned Table On S. Bowman Indoors Tennessee passed Michigan in the stretch to win. At Penn, revenge was sweet. *Nicole Edwards leads Michigan to Penn Relays win in DMR - She outkicked Sarah Bowman of Tennessee as the teams ran blistering fast 10:49 and 10:50 (2nd fastest collegiate DMR). Brie Felnagle runs 430 anchor split for UNC. *Host Penn Sets Ivy League Record In Women's DMR With 11:08 - 6th Place Showing. *Distance Carnival: Anthony Famiglietti Breaks Franklin Field Record By Running 8:22 For Win in Steeple It was his third win in the steeple in three weeks. (Message board thread here) On the women's side, the Princeton women looked to be regaining their early season xc form as they had a great night and won the 3k, 5k and had a runner-up in the steeple. *Penn Relays Preview - 6 Teams Might Win Men's 4 x 800. This article claims Texas/LSU are favorites. Sorry Columbia. Drugs: Trevor Graham's Lawyer Says Expect No Plea Bargain Trial to Start May 19 Hopefully it'll go to trial so the truth will come out. Everyone is starting to talk about this. Hell, perhaps Graham just wants to testify to get the Word out about other coaches being dirty. *Steve Cram: Get Ready for Names To Be Named In Latest Sprint Doping Scandal Cram talks about Ato. LRC Robert Cheruiyot: The Best Marathoner in the World? 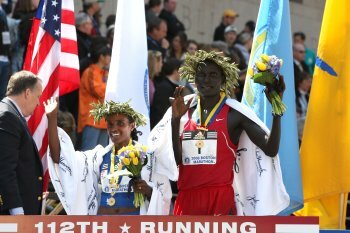 No (It's Martin Lel) After thinking about it for 2 days, it's obvious to us that Cheruiyot can not be deemed the top marathoner in the World because four of his World Marathon Majors wins have come versus the weakened fields in Boston. Goumri would be undefeated in his marathon career if he raced the fields Cheuiyot has been up against. Plus we remember the time just 2 years ago when Meb Keflezighi was the favorite to win Boston. On the boards: My 11 year-old son wants to run a half-marathon: Good idea or not? Boston and New York Both Appear To Want Trials Back (With Changes) Mainly it looks like they (particularly the cash strapped Boston) don't want to pay $1 million to host them. *Another look at Cheruyiot's Win in Boston He described why he made his move early in the race instead of waiting for the hills. "For me, it was better to kill them before. When the lion wants meat, he has to kill." *Runner-Up Abderrahime Bouramdane Had Trouble With His Sock That Gave Him Blisters A class act as he congratulated Cheruyiot for his win. LetsRun.com Women's Recap New Ethiopian Star Dire Tune Wins Epic Duel A day after the women's US Olympic marathon trials, it was only fitting that the women put on a remarkable show on Monday. In the end, after the fastest 2nd half ever (70:36), Dire Tune edged Alevtina Biktimirova by 2 seconds in the closest women's race in Boston's legendary history. However, to defeat the tough Russian she had to run the last mile faster than the men's winner. The Trials: LetsRun.com Preview: Deena and ... Athletes spend years dreaming and striving for the Olympics and on Sunday 3 people will have their dreams answered by booking tickets to Beijing at the 2008 US Olympic Trials. 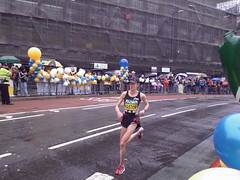 In theory Deena Kastor could give the rest of the women a 2 mile head start and still win on Sunday. In 2004, she could have given them a 1.5 mile head start and she lost, so that is why they run the race. When they give out the USA jerseys for Beijing, they're all the same no matter what ones qualifying time was. We give our exclusive analysis and pick the team for Beijing. *Elva Dryer: "For me, the experiences and the memories are what keep me motivated, and I loved wearing that USA on my sleeve"
The Times of London Picks Up on Ato Boldon, John Smith Letter The article takes an in depth look at whether the letter is legit and the possible implications of it. Good read. We had taken the letter down from letsrun but may now put it back up. If you're not familiar with Lalang you might want to start here. We were sent the article on him this week. Friday Recap: The story is the cold weather which is making for slow times. None the less there was a meet record in the javelin. *Day 1 Recap: Chante Howard Wins Women's HJ With 6'4.75 - Lisa Koll Wins 5k 15:59 - Alan Webb Withdraws Maternity leave doesn't seem to have hurt the HJ star Howard who is the world leader. *Allen Johnson Talks About Running Drake For 1st Time In his final year of competition, he wants to experience Drake. Smart Move Or Signs of Panic? We say smart move as he simply can't afford to have another bad race. 1) Villanova Coach O'Sullivan just wants to see improvement at Penn Relays The article is full of a lot of inspiring quotes as it tells people how O'Sullivan went from being a walk-on (4:25 HS miler)to a world record holder. O'Sullivan: "I didn't get good until (my sophomore year of college). I could've quit. I just kept working hard and it paid off. That's what it's about. Talent is a very small part." 2) 10:48 HS Two Mile Dave Berdan wins Penn Relays Olympic Development 10k Our former training partner in Flagstaff takes it down. Alan Wells - Scottish 100m Olympic Champ From Disillusioned By Drugs Cheats In Sprinting Hard to believe the 100m winning time in 1980 was 10.25. What makes him most suspicious is how sprinters maintain their form for months on end. LRC The Week that Was: April 24, 2008 We go behind the scenes and give you our exclusive take on this past weekend's action which was centered in Boston. We have some praise for the BAA and the fans in Boston, praise for the 152nd qualifier for the Olympic Marathon Trials (who went on to finish 5th), and praise for some 45+ year-old women. But don't worry we're still criticizing the BAA for being in the dark ages and are critical of the TV coverage in Boston. Plus, Mt. Sac, the ACC meet, and the big event of the week, the LetsRun.com Puma Party in Boston. Race Walking World Cup Returns To Cheboksary Where In 2003 They Got 50 to 75,000 Spectators Just shows you what good marketing can do. LawShawn Merritt Profile Most people don't realize his stats at the same age are pretty comparable to Jeremy Wariner's . Age 20,:Wariner 44.00, Merritt 44.14. Age 21: Wariner 43.93, Merritt 43.96. Kenyan Editorial: Pick Kenyan Olympic Marathon Team Now We agree. How about we do it for them with zero hesitation? Lel, Wanjiru an Cheruyiot. Don't even think about anyone else. Tyson Gay Runs 8.8 Relay Split At Mt. Sac Relays - Crazy to think he almost faced Asafa Powell considering European promoters can't get them to race. *Asafa Powell Pulled Out of Mt. Sac With Injured Shoulder Nothing serious at all. Claims it would hurt to reach back for baton. Kenyans Getting Ready for Africa Champs Which Start Wed.
Boston is Monday: *Chicago Champ Patrick Ivuti Out of Boston with Malaria The race is definitely Robert's Cheruiyots to lose. LetsRun.com Preview coming. Check back late today. The response to the LetsRun.com Party Hosted by Puma in Boston was overwhelming. We had hundreds of people apply for a very limited number of spots. We show you some of the lucky winners, lucky losers, and let you pick who is the most deserving person at the party and the person who got shafted the most. Plus details on the party, Harpoon beer, Sauza tequila, and models on hand to give out the gift bags. 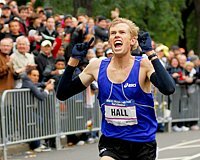 Update: LetsRun.com Party Makes the Boston Herald Contrary to what it says the party is invitation only.